We expect copies of text highlighted on a screen, digital files and software to be indistinguishable replicas of an original. CMD (or CTRL)+C grants the power to duplicate at will, at your convenience, digitally and exactly. Analog copies are usually good enough; even when dappled by stray ink, paper belched from the grinding innards of a vintage Xerox photocopier remains readable. From a sonic analog of waveforms stamped onto a surface, the standard turntable delivers a copy to the ears: a motor-driven belt turns a platter at a constant rate while a needle, whose vibrations get amplified and translated, rides through a groove. Replace the needle at the record’s beginning and, aside from any accumulated pops and clicks, you re-hear the sound. When transformed into an instrument (think early Pierre Schaeffer, rap’s myriad masters of the “Wheels of Steel,” Christian Marclay, Marina Rosenfeld), the turntable — or as a practice, “turntablism” — no longer copies, but modifies sound. Turntablists transform previously unwanted and disruptive events such as skipping, the slipcue, scratching, and groove-jumping into music. Yet several elements central to the turntable nonetheless remain in place, including electrical power, amplification, and proximity thereto; continual (or controllably variable) speed; the use of microgroove LPs (and the format’s attendant variety and bulk of available material); and the reliable functioning of the turntable itself. 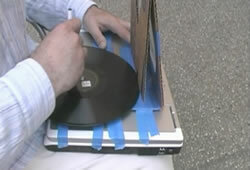 The flap-o-phone bypasses such subcutaneous assumptions by allowing performers to employ the turntable as a site-specific, self-demolishing instrument entirely under the power of the performer. Figure 1. The flap-o-phone. Photo © Nic Collins. The flap-o-phone is a record player made out of cardboard. 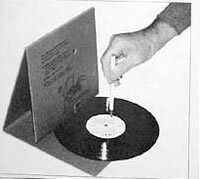 Three flaps of cardboard, a narrow-tipped nail and a pen can exhume sound from a 78 rpm record; with a steady hand and reliable surface anyone can make the flap-o-phone mimic a standard turntable. Video 1 (0:54). Christopher DeLaurenti plays Goofus on the flap-o-phone (2008). Figure 2. The only CardTalk player image that was available on the web circa 2006. Photo © 2002 Mountain States Collector. Figure 3. Prototypes of the flap-o-phone (2006–07). Photo © Christopher DeLaurenti. The flap-o-phone is a poor copy of the CardTalk record player which in turn is a poor (but ingenious) copy of the standard turntable. Devised in the early 1960s by Christian missionary Joy Ridderhof and her associates at Gospel Recordings (later known as GRN, a.k.a. Global Recordings Network), the CardTalk Record Player was devised to help missionaries working in remote areas without electrical power convert followers to Christianity with recordings of the Bible read in the native language (Global Recordings Network). Although similar playback devices were patented by Jean Jauquet in 1953 (Ludacer 2010) and appeared as a children’s toy in the mid-1950s (Roden 2010), I found out about the CardTalk in 2006 from a promotional website for The Tailenders, a documentary about GRN and its use of technology for evangelization (Horne 2006). Additional information on the CardTalk was scarce. With only a small image (Fig. 2) to guide me, I scrounged cardboard, nails and ball point pens for a “best-guess” prototype. Soon thereafter, I found bigger photos and crude plans on neatscience.com, a DIY site by Dan Keith, a high school science teacher at Williamston Middle School (Michigan); I made multiple modifications (mounting, record spindle, needle housing, etc.) to Keith’s plans. Christened the “flap-o-phone” by the poet Jeremy Hoevenaar, I played the instrument publicly in Chicago, Seattle, Montreal, Dallas, New York and Milwaukee from 2006 to 2011. I juxtaposed a low-fidelity record, usually Glenn Miller’s Blue Evening or Intrigue by Billy Eckstine, with nearby environmental sound, listening for common elements and contrasts. I seldom played the record straight through, instead varying the speed and direction as well as pausing to fragment the lyrics into an improvised commentary. The relatively quiet, unamplified volume of the flap-o-phone enabled intimate performances and the embrace of sounds external to the instrument. Indeed, waiting and silence — or appearing to do nothing but stay stock still — are crucial; this DJ is not only a listener but a statue, which can puzzle passers-by (and sometimes local police) and also act as an invitation for the curious. Performances can be tailored for the person sitting next to you. The obvious flimsiness of the flap-o-phone not only spurs discussion about sound (and how phonographs work) but invites the public to try an instrument whose apparent poverty dispels any fear of inflicting damage or seeming incompetent. One example is the unedited Blue Evening, which I documented with binaural microphones (Audio 1). Audio 1 (8:38). Christopher DeLaurenti — Blue Evening (a flap-o-phone nocturne). Live improvisation using the flap-o-phone next to a paved road by Annandale-on-Hudson NY in the evening of 28 June 2007. 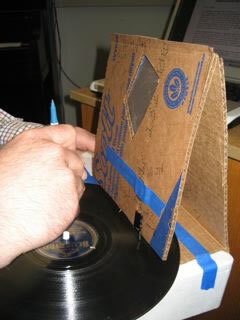 In 2008, I built an outsize flap-o-phone to accommodate the 10-inch diameter of “classical” 78s. I then organized a concert titled “DeLaurenti Plays Stravinsky” to perform 78 rpm records of Stravinsky playing his Piano-Rag Music, as well as all six sides of the Capriccio for Piano and Orchestra. I added changes in pitch and tempo along with pauses and abrupt stops. Also, I welcomed the flap-o-phone’s occasional squealing and unexpected malfunctioning. Hand-cranking the 78s for these performances required a great deal of physical endurance. Cramps in the arm and hand are inevitable, so I tried to build the results of such failures — sudden stops, spasmodic changes in tempo, and the entire apparatus collapsing (or falling to the floor) — into the performance. A recording of my May 2010 performance of Ravel’s Bolero on the flap-o-phone (Audio 2) is a prime example of the issues described above. Audio 2 (17:53). Christopher DeLaurenti playing Maurice Ravel’s Bolero on the flap-o-phone. Live performance on Miniature Minotaurs, hosted by Kurt Gottschalk on WFMU-FM 91.1 (Jersey City NJ), 17 May 2010. NB the recording has not been edited or overdubbed. And do what you want. The flap-o-phone is easy to build; my “flap-o-phone Construction and Assembly Instructions” are published separately in this issue of eContact!. Contact me if you have questions! Block, Ursula and Michael Glasmeier (Eds.). Broken Music: Artists’ Recordworks. Berlin: Berliner Künstlerprogramm des DAAD / gelbe Musik, 1988. Collins, Nicolas. Handmade Electronic Music. 2nd edition. New York: Routledge, 2009. Ferguson, Russell, Miwon Kwon, Douglas Kahn and Alan Licht. Christian Marclay. Ed. Russell Ferguson. Los Angeles & Gottingen: The Hammer Museum & Steidl, 2003.